Talks on hepatitis and liver cancer and the importance of writing wills was conducted in the KK High School auditorium starting from 8:30 a.m. 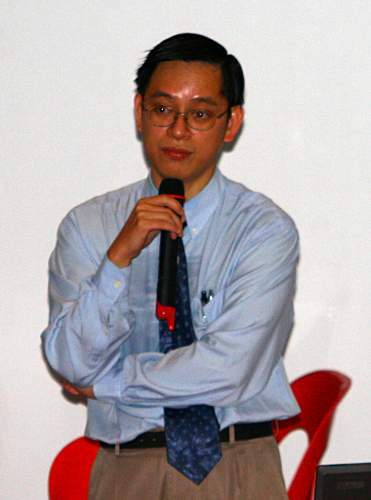 The talk on hepatitis and liver cancer was given by Dr Tee Hoi Poh, from Queen Elizabeth hospital, Kota Kinabalu. His talk touched on the causes of liver cancer, as well as the symptoms, diagnosis and treatment of both hepatitis and liver cancer. The second talk, on writing a will, was conducted by Mr. Yap Hock Lee of Rockwills Professional Will-writing Services. He impressed upon the audience about the importance of writing a will, especially when it comes to distributing one's property. Mr. Yap gave some real life examples of people (no names were mentioned) and their heirs who had problems because there was no will to settle the wrangling that cropped up after the person's demise. He also shared some advice on how to get a will written properly. 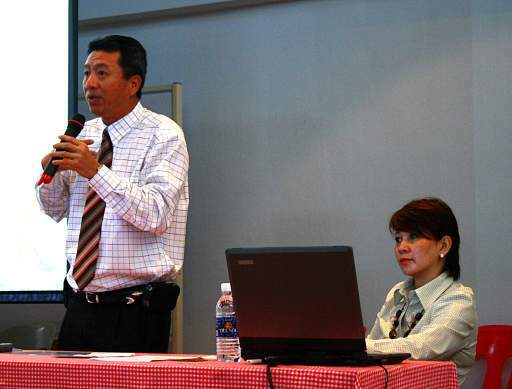 (L-R) Mr. Yap Hock Lee and Ms. Jenny Ang of Rockwills Professional Will-writing Services.